LOVE CRAFTS FOREVER: Sweet Pea Stamps Blog Hop!!!!!! Welcome to the Sweet Pea Stamps Blog Hop! Today the design team is featuring the stunning new images in the Rebecca Sinz collection. Here is a list of the stops today, as you visit each one remember to leave a comment at every stop. 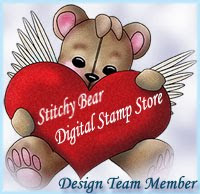 On Monday, March 18, 2013 we will pick one winner to receive a $10 gift certificate to the Sweet Pea Stamps store! I colored image with pencils and Die cut with Spellbinders. Sentiment is a clear stamp, and i punched out after i stamped. Added White Bow. Your next stop is amazing Ali. Nothing Deadly about this image, she beautiful and your colouring reflects this. Nice sentiment too! This is stunning in B/W Nat!! Really elegant work. Beautiful! Love the way you colored her. Nat - the hair is fantastic I love your Colouring. Beautiful card! This is such a fun card. love the colors and the papers!! Love it all! Your card is absolutely gorgeous! I love that image and your coloring is fabulous! Have a wonderful weekend! Very pretty! I don't think she is deadly unless they mean deadly beautiful. Your coloring is amazing and I love how you choose the black and white/whitish background so it doesn't take away from the image. Love how the blue stands out against the black and white. Awsome. Love the sentiment - how true! Great card. Love that image, and all the layers on your card! Sweet! this is very beautiful Nataliya. Hi Nat! I love the contrast between the colorful stamp and black/white papers! Amazing coloring as always!! Gorgeous - I love the contrast between the coloring of the iamge and the black and white layers.